4:00 AM Fiji Time – Since it was 9:00 AM back home in California, Cagey awoke, hungry for breakfast. She arose and the fruit plate, which contained some juicy leftovers from our arrival, the previous day. She ate while I slept. 6:00 AM – The Sun comes up shortly after 6:00 AM and sets shortly after 6:00 PM. 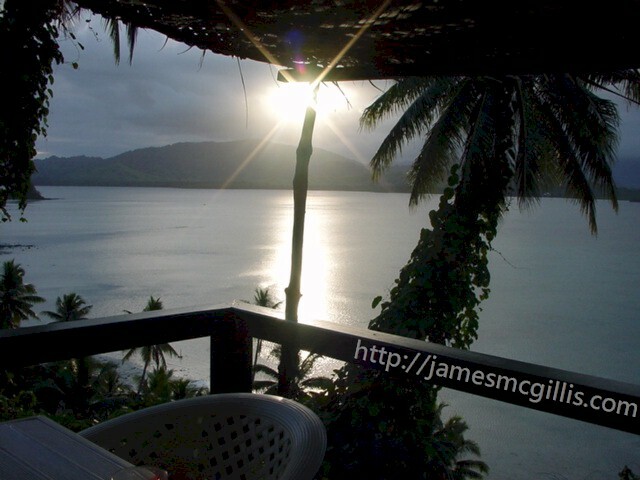 The dawn and twilight are shorter in the tropics, leading to the impression that you are in something like an old Walt Disney cartoon, where day breaks, the rooster crows and life in the barnyard is moving at full speed in just a few seconds. 7:00 AM – Somehow, I was able to stay asleep until about 7:00 AM. By that time, our “barnyard” was so full of bird squawks, chirps, squeaks and caws that I had to pay attention and finally get up. As usual, it was not cold, but not hot either. I made my way out on to our Lanai. There I discovered the Myna Birds who had awakened me. Their habit was to make a lot of noise after sunrise, then to disappear about thirty minutes later, when there was no chance of our going back to sleep. 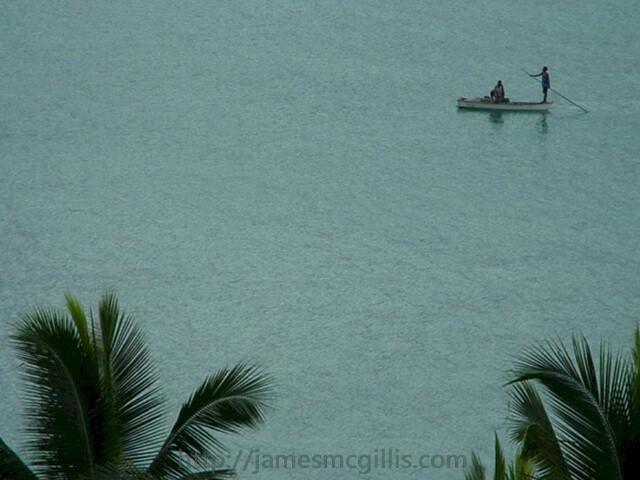 7:30 AM – Natewa Bay, which takes up the foreground, background and the middle ground of our view from the Lanai is one of those natural phenomena that takes some time to figure out, but absolutely no time to appreciate. 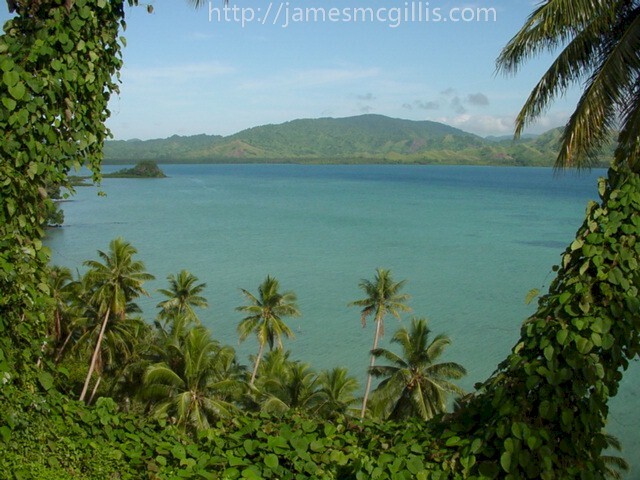 “Discovered” hundreds of years ago during early English voyagers, it was called “Nateva Bay” on reproductions of the original charts that we later saw at the Museum in Suva, The capital of Fiji. The Lomalagi Resort website has a few wide-angle shots of the bay and its sunsets. Before we arrived there, we had read on the website that Lomalagi was the only resort on the Bay, which encompasses 600 square miles of water, surrounded on three sides by lush volcanic mountains of varying topography. Just like you, I was trying to picture a bay of that size with only a spot or two of human habitation. I just could not picture it, or maybe I could not believe it. When we arrived, it was at New Moon, which made the nights very dark and the tides of the Bay come in and go out at levels known as “astronomical”. We tend to use the word astronomical to mean huge or large. The term takes on its true meaning here when you wake up and see sand bars miles off shore and an empty bay at you feet, only to find it brimming full only a few hours later. Similar to Mont Saint-Michel, a castle in France that sits on a tidal island, you can almost watch the tide fill in or recede in the bay, depending on the time of day. As the Moon entered a fuller state, the tides moderated and the bay did not go through the major highs and lows, as it did for the first several days of our visit. As our host Terry said, “I have never seen a bay that looks good at low tide”. I know it is only 7:00 AM, but I must tell you about the nights on Natewa Bay during the time of the New Moon. Before our arrival, I was disappointed that we would not have a Full Moon during our visit, figuring that the Moon over the water was probably a sight to see. Little did I know that the most beautiful nights are those with no Moon. You must remember that “light pollution” has not yet occurred along Natewa Bay. Most of the surface area is ocean, which emits no light. What land that exists, is mainly not “electrified”, even in many places on the main island. The few cites that have been built have neon and streetlights and many cars. However, they are over an hour away by airplane! Upon returning to our bure (or villa) at night, turning out our room lights and looking out across the water it is a remarkable sight. The Milky Way is above, brighter than anywhere else you might see it (other than Antarctica, I suppose), casting enough light to dimly illuminate the basic features of land and bay. Across the water, we could see three or four lantern lights at our end of the bay. We saw several more lights from a village across the bay, which apparently has a small generator. That was it. The entire bay had a couple of electric lamps and half a dozen lanterns. Later we found that the lanterns on the water were from the fishing families who ventured out on “billybillys”, which are watercraft made by lashing about eight coconut logs together. 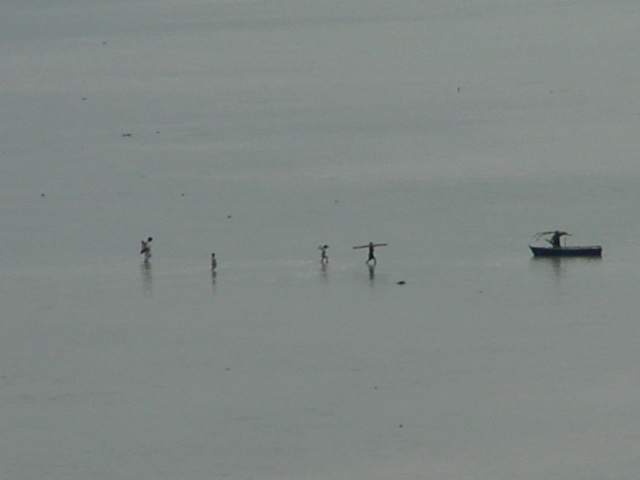 They "pole out" into the shallows, where they drift until dawn, with their fishing hand-lines in the water. We learned that a few years earlier there had been a fishing craze, with many billybillys on the water each night. Predictably, the villagers had over-fished the shallows of the bay and thus they reverted to the “specialists”, who fished for all within their villages. If you have ever sat and contemplated a Japanese painting and seen the vision of the artist come to life, you will know what it is like to stand at our window at any time of the night, even 3:00 AM. Reassuringly, the fishers were there, each billybilly displaying a single lantern as it glided along in the shallow bay. Peace, harmony and beauty prevailed. This is Chapter Six of ten chapters. To view the previous article in this series, click HERE. To view the following article in this series, click HERE.